Hunt Club Medical Care is open seven days-a-week and offers urgent care and same-day appointments. Pictured are, Dr. Pinida Toochinda; Casey Seltzer, PA-C; and Dr. Michael Gordon. Not pictured are Kate D’Amato, PA and Samantha Buhler, PA.
Take a deep breath, step through the doors, and let the Hunt Club Medical Care family take care of yours. In addition to providing exceptional medical care, the team of professionals will provide you with the ability to take an active role in your own care. After all, there is no one better suited to take care of you like family. Having been an important part of the local community since 1978, Hunt Club Medical Care is dedicated to providing quality health care with compassion, dedication, and convenience. Through effective communication, they provide guidance and support for your healthcare needs. For over 30 years, Hunt Club Medical Care has been caring for people and improving the quality of life in the community they serve. Their goal is to deliver the highest quality health care available in the area. 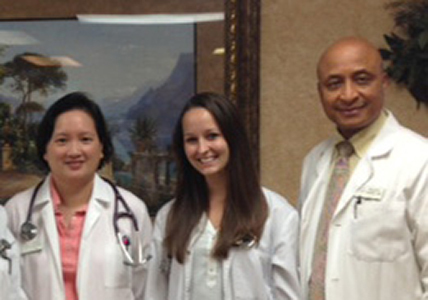 As board-certified physicians in Internal Medicine and Family Practice, they have provided both primary care and urgent care in Apopka, Florida from the very start. In their efforts to accommodate working families, they are open seven days-a-week with extended hours. Hunt Club Medical Care offers family care, urgent care, same day appointments, well-woman exams, chronic disease management, preventative medicine, annual physicals, school sports physicals, and on-sight x-rays, and consists of long-term staff who are highly skilled at providing patients with evidence-based care, as well as support for self-management of their health and health care. The Hunt Club Medical Care facility is privately owned and operated by Dr. Michael Gordon. The goal of this medical facility is to provide comprehensive care to their patients. On staff are Erin Cottengim, PA-C; Samantha Buhler, PA-C; Dr. Pinida Toochinda; Casey Seltzer, PA-C; and Dr. Michael Gordon. Their award-winning electronic medical records (EMR) system allows the clinicians to quickly locate and maintain each patient’s most up-to-date health and examination records. They also have x-ray and EKG testing on site. A number of local businesses have selected the team at Hunt Club Medical Care to provide care for their employees, including pre-employment exams and treatment for work related injuries. The staff at Hunt Club Medical Care strives to be distinctive. They genuinely care for the comfort and well being of their patients by treating them with courtesy, dignity, and respect. They are comprehensive in the response to the needs of their patients, and consider themselves to be partners with their patients in their health care. They make every effort to always be innovative in their approach to care. Appointments can be scheduled when needed, although Hunt Club Medical Care operates on a walk-in basis for added patient convenience. In attempt to minimize waiting time, they are staffed with two or three clinicians on duty. They are open every day: Monday through Thursday, from 8 a.m. to 7 p.m., Friday, from 8 a.m. to 6 p.m., and Saturday and Sunday, from 8 a.m. to 4 p.m. They are conveniently located at 3191 E. Semoran Boulevard, across from Colonial Shoppes of Bear Lake. Call Hunt Club Medical Care at 407-788-6500 to help with your medical needs.